Comments Off on Where Were the Numbers 1 and 2 ? The whereabouts of the Number 1 and the Number 2 public Houses has long been the subject of debate among local historians. The existence of two public houses in Blackpool called the “No.4” and the “No.3” naturally elicits the question “Where were the No.2 and No.1 ?” And several local historians have given their opinions over the years. As the numbers increase away from Blackpool, it seems likely that the No.1 was on the Promenade at the bottom of Church Street and, indeed, there was a hotel in this position from the late 18th century – the Lane Ends Hotel. 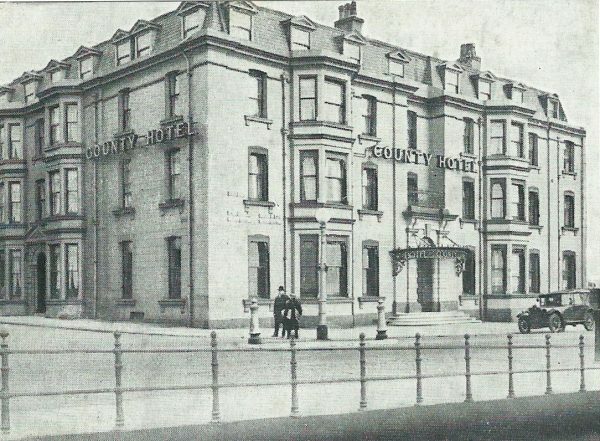 It was rebuilt in 1864 as the County and Lane Ends Hotel, demolished for Lewis’s store at the end of 1961. It follows that the No.2 would have been somewhere between the Lane Ends and the No.3. Allen Clarke, Kathleen Eyre, and even the authoritative Reginald Sharpe France, suggested it had been the Adelphi Hotel, now Vision Express on Church Street. Some locals thought that the now derelict Grosvenor Hotel at the corner of Cookson Street had been the No.2, and even the Saddle at Marton has been suggested. To make some headway, we ought to consider what the mysterious numbers might have represented. The No.3 and No.4 were both on the old route from Blackpool to Poulton. The route turned left in front of the No.4, passing through the village street of Great Layton (the presentLayton Road) before turning right at Hoo Hill windmill and meandering towards Poulton. Until the coming of the railway in the 1840s, Blackpool relied on Poulton for most of its supplies. It has been suggested that the No. 3 and No. 4 had been coaching inns; from as early as 1781 coaches were bringing visitors to Blackpool. But coaching inns would have been unnecessary so close to the fledgling resort and, in any case, most coaches came in from Preston via Lytham. A more likely possibility is that the numbers denoted pick-up points for carriers. Although inns would have been convenient for this purpose, it does not follow that there had to be one at each designated pickup point. Most writers on the subject have overlooked a significant fact: The earliest reference to the No.3 is in William Hutton’s description of Blackpool, published following his visit in 1788. It follows that any other candidate for the No.2 has to have been in existence at that time. The Adelphi Hotel, however, was built by Esau Carter about 1835 and Grosvenor Hotel dates from the early 1870s. Although just across the road from Lane Ends Hotel, the Albion Hotel was thought by some local experts in the early 20th century to have been the No.2. However, this hotel (on the site of Burton’s Buildings) was only built in 1828. The earliest known reference to the No. 4, incidentally, is in Baines’ Directory of Lancashire published in 1824. It is also mentioned on page 275 of William Thornber’s history of Blackpool, published in 1837. The present hotel was built around and in front of the old building circa 1892. In the course of some correspondence in the Gazette at the end of 1923, when the usual theories were trotted out, an intriguing and plausible alternative location for the No. 2 was mentioned. In response to a letter citing the Adelphi, then being rebuilt, the Gazette writer “Zephyrus” was emphatic that Councillor Richard Swarbrick, a director of the brewers C&S, knew that a cottage demolished in 1906 at the junction of Church Street and Elizabeth Street had once been the No.2 Inn, kept by his maternal grandparents, Thomas and Ellen Bagot. In the 18th century a little community had existed there, known as Layton Rakes. Born in 1864, Richard Swarbrick remembered his mother visiting relations there. Moreover, he remembered seeing the old tarred number “2” being exposed after a violent storm which had removed the covering of whitewash. This was corroborated by a letter from Alfred Lomax stating that Thomas Taylor, then 83, recalled that he lived in the same cottage from the age of six (about 1847) and, following his marriage, he lived in an adjacent cottage for 42 years. He was there when the storm referred to occurred. It brought away the rough casting on the wall, and the crash had woken him. There, in the morning, he plainly saw the name in black, “No.2.” The writer said that yet another resident confirmed that this cottage had been the No.2 and had also seen the number on the wall. Mr. Taylor was reported as saying that the late Thomas Bagot, a former sexton of St. John’s and related to Richard Swarbrick, had told him that he had enjoyed many a pot of beer at No. 2, but Taylor himself had no recollection of it having been a beer house. No known records exist that show it to have been licensed. The 1841 Census returns show Bagot living at Layton Rakes. Before his death in 1887 aged 88, Thomas Bagot’s reminiscences of Blackpool in the 1840s had been published in the local press, although there had been no mention of the No. 2. However convincing, the reports are, after all, hearsay and the location of the No. 2 will probably never be determined with any certainty. A positive outcome, though, was that the correspondence inspired a long series of articles in the Gazette throughout 1924 on Blackpool’s early history. They were written by the journalist Ben Bowman and provide detail unmatched until the research of modern local historians Norman Cunliffe and the late Alan Stott. Although Bowman did not write specifically about the No.2, that he accepted Layton Rakes as its location is shown by his assertion that Thomas Bagot’s daughter Ellen had been born at No.2.